On 27 March, LCC Director Lyn Evans paid a courtesy visit to Japan’s Prime Minister Shinzo Abe. The Prime Minister acknowledged the significance of the linear collider project for the whole of humankind. Given that it is an international project, he said he needed to monitor the development closely and would continue to investigate the role of Japan. The video of the visit is also available at the Cabinet’s website. 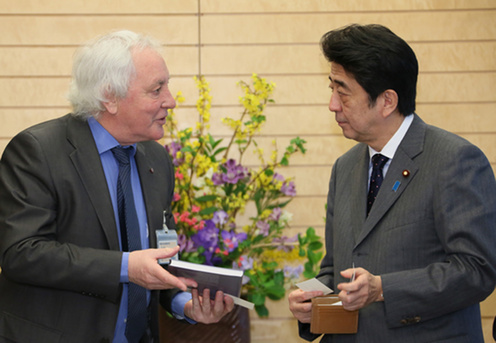 Lyn Evans presented Prime Minister Abe with a book about the LHC. 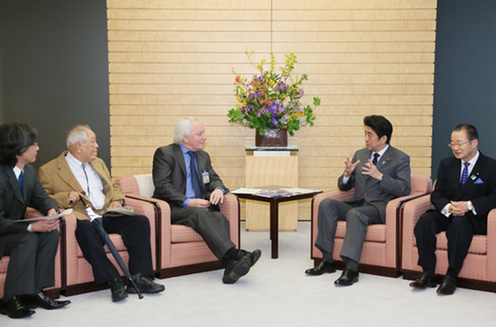 From left: Hitoshi Murayama, LCC Deputy Director, Masatoshi Koshiba, 2002 Nobel laureate in Physics, Lyn Evans, Shinzo Abe, and Takeo Kawamura, Chair of the Diet members association for ILC.